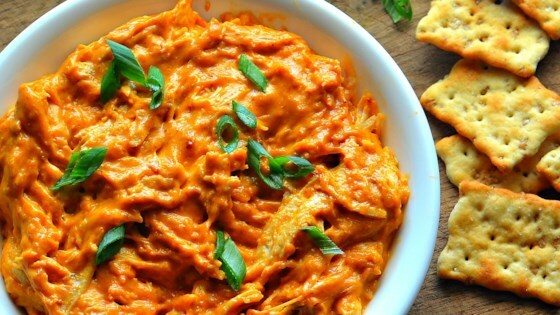 "Want to make Buffalo chicken dip and all you have is frozen chicken? No stress, just cook the frozen chicken breasts in a pressure cooker such as an Instant Pot®, start to finish in 30 minutes. Instructions for thawed chicken are included." Combine chicken breasts and broth in a multi-functional pressure cooker (such as Instant Pot(R)). Close and lock the lid. Select high pressure according to manufacturer's instructions; set timer for 10 minutes. Allow 10 to 15 minutes for pressure to build. Release pressure using the natural-release method according to manufacturer's instructions for 10 minutes. Release remaining pressure carefully using the quick-release method according to manufacturer's instructions, about 5 minutes. Unlock and remove the lid. Transfer chicken to a bowl and shred. Select Saute function. Add cream cheese, sriracha, ranch dressing, and chile-garlic sauce. Return shredded chicken to the pot. Slowly add Cheddar cheese, constantly stirring until melted and all ingredients are well combined. Select Keep Warm function until ready to serve. Garnish with green onions. You can cook thawed chicken breasts by setting the time for 15 minutes at high pressure and use a quick release. Great recipe! Thank you! because we really like spicy, I made a couple of additions. I tripled the garlic chili sauce and added garlic buffalo sauce to the mix. This recipe is fantastic! It was very good! Cut back on siracchia and my husband liked it better! Made it like the recipe and I would make it again!